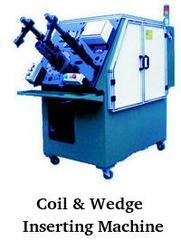 We are a leading Manufacturer of coil & wedge inserting machine from Faridabad, India. Wedge is inserted automatically in accordance with stack height of stator, and coil can be inserted automatically with one pass in compliance with specification of winding by transfer tool. It can enhance insertion efficiency highly, and reduce the production cost. 1. High speed automatic insertion, labor saving, cost reduction and stable quality output. 2. Easy and quick to change tool according stack height of stator. 3. Change different tool to meet different kinds of stator. We have gained sound reputation as trusted manufacturers and suppliers of Coil & Wedge Inserting Machine that is commonly used for winding applications in diverse industries. It is manufactured by using standard processes as prescribed by the norms of the industry. We use the best grades of basic components conduct stringent quality test to ensure flawlessness of these machines. It is offered at reasonable rates to our clients. 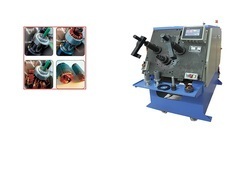 Looking for Coil & Wedge Inserting Machine ?